The effect is shown in the accompanying diagram, Fig. 15, illustrating the same building of fifteen floors, at the prevailing rental of $1.80 per square foot. In this building the addition of a manufacturing plant and space therefor has involved an additional capital expenditure of $18.57 for the square foot of building area, requiring interest amounting to 74 cents to be paid, at the rate of 4% per annum. The interest thus required is found to involve the addition to the building of two and one-third floors, the cost of which adds another $14.58 of capital expenditure. 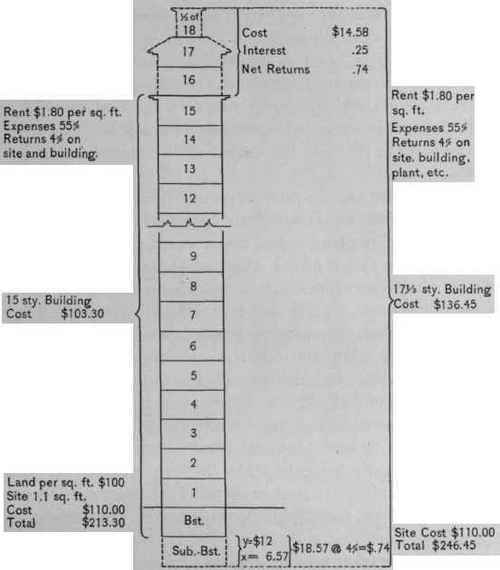 The additional renting space thus provided brings in a net return of 56.7 cents per floor, from which has to be deducted 25 cents for interest upon the cost of these floors, leaving available 31.7 cents per floor, or from the two and one-third floors the 74 cents required for interest on the plant and space below ground. The additional total capital expenditure is $33.15, which is an increase of 32% on the cost of the building. 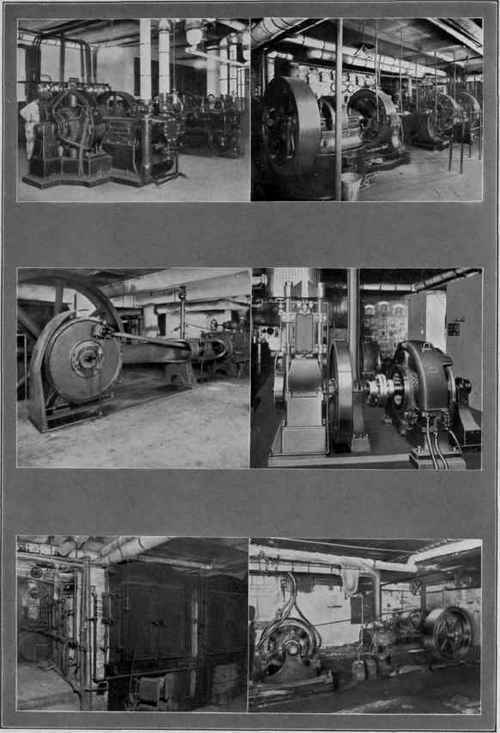 It will be evident that if this capital be not expended upon apparatus and its interest-producing rental space, there will be resultant effects which may be properly credited toward any additional cost, if such there should be, of public services or supplies taking the place of the output of the manufacturing apparatus. Thus, not only will the interest on the capital outlay be saved, but a smaller amount of capital will have been engaged upon the maintenance of the land value, and a lesser extent of depreciation and deterioration of the whole building will have been involved, while the property will be proportionately less of a target for present and future taxation. Increase of height, which is required, may also be avoided, which would have involved not only additional relative cost of the construction of the whole building, but also an addition to the relative cost of operation of the building. In further considering this investment of capital upon the appliances and the rentable space connected therewith, the question will naturally arise whether the engagement of capital therein can produce returns or offer advantages equivalent to that of additional renting space provided by the same capital expenditure. "The commercial value of such apparatus is limited to its ability to compete with an exterior service"
Manufacturing or Power Machinery enhancing- the value of the complete product might bring in a greater net profit by increasing the gross output. The same principle appears in the application of manufacturing machinery in buildings. If it be found, for instance, that a supply of gas be desirable or necessary in a building, it does not follow that a gas-manufacturing plant competing with the present price of a public supply of gas will produce enough return by any difference between price of that supply and cost of its own output to justify the expenditure accompanying its installation, when compared with the results derivable from an expenditure of the same capital in enlarging the area or improving the rentable character of the tenantable part of the building. Thus, to refer to the previous illustration of a 15-story building, if we assume that the expenditure of $18.57 involved in a plant should be expended instead in constructing additional renting space, it would add (at the same rate of cost of construction) three stories to the assumed square foot of vertical section of the building. The rentable space thus provided would bring in a gross addition to rents of $3.78 per annum. If we should assume that the purchase of supplies of a mechanical nature from public services instead of their manufacture on the premises would involve an addition of as much as 25% to the cost of the entire mechanical services, this would be but one quarter of one fifth of the gross income, and in this instance would amount to 95 cents. Deducting this entire amount from the gross return of the three added floors, still leaves a net addition to the rentals of $2.83. Reducing this amount to the net of 45%, leaves $1.27, which, upon the expenditure of $18.57, brings back interest at nearly 7% per annum, a return which is much higher than that obtainable by the investment in the plant and cellar. Finally, the security afforded by a building to a mortgagee is not proportionately increased by the capital expended upon machinery, because the life of the latter is shorter than that of the building, and involves future expenditures which might fall upon the mortgagee. Such apparatus does not form a security for bonded or mortgage funds of the same stability and life as a building or land.